President and founder Sherman D. Manning wrote some powerfull books and is an expert on wrongful convictions. Sherman Manning is a brilliant intellectual who has passion, energy and charisma. These books are about wrongful convictions, injustice, prison guard corruption and judicial misconduct. When we witness an injustice, we have a duty to argue. Please check out his new powerfull books and support G.B.G. Gang Bangers for God. Sherman Mannings brand new book K.K.K. (Kids Killing Kids) with a foreword by Attorney Robert D. Blasier is now out! Check it out! It's no fiction it's all true. Sherman reveals prison secrets that Eric Menendez, Lyle, Daniel Henson, the Marcia Clark stalker (Mr. Bardo) amd Mary Hanlon Stone don't want you to know. Attorney Robert D. Blasier was on the O.J. Simpson Dream Team with Johnnie Cochran, He is a world-renowned DNA expert. He fully endorses this book and wants every at-risk teen to read it. What is G.B.G doing for you? Send your name to "hallopeter@sunrise.ch" and tell us. Sherman D. Manning reached out to me because I was onthe O.J. Simpson Dream Team with Johnnie Cochran and others. He asked me toperuse, endorse and promote this major-book "K. K. K." Sherman is aunique man who is determined to use the errors of his past to transform thefuture of all of youths. It is unusual (an understatement) that I'm writing theforeword for "K. K. K." Not merely because the author isincarcerated. Many powerful, spellbinding and great books have been penned bymen in the "pen". What is strange is howI've come to know Sherman. I've ordered every Book he has written. And I'mimpressed with Sherman's writing skills. K. K. K. is the kind of Book that you can pickup andopen to any page at random and still be enthralled by Sherman's vividdescriptions of life in prison. 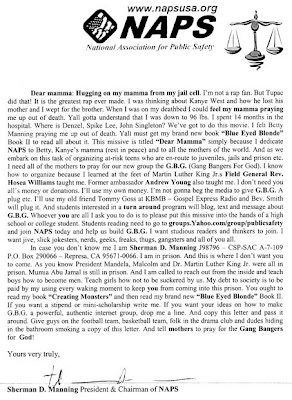 Sherman wrote to me: "I need you to help me reach these youths and divertthem from these prisons." When we secured victory in theO.J. Simpson trial in 1995, Johnnie told the press that his law practice wasmore about the No J's than the O.J.'s. Until he suddenly passed away, Johnnie wasa voice to the voiceless and a champion to the underdog. I cannot endorse every ideal, claim or accusation thatSherman writes in K.K.K. That's not even what he requested. What I can and willdo is fully endorse the mission of G.B.G. (Gang Bangers for God) and HEART(Helping Educate at Risk Teens). And I hope that judges, lawyers, professors,criminal justice students, and kids in trouble will peruse this book. It is compelling and unlike most of the books writtenabout prisoners and prisons. Sherman is embedded in his story. He writes inreal-time, with a "no-holds-barred" approach. He "names-names" not only aboutother prisoners but about corrupt employees within the California Department ofCorrections. Sherman is an expert on the prisons, which our kidsare routinely sent to. This Landmark-Mega-Book is a powerful psychologicalportrait of the mentality of people in prisons. I hope that judges, prosecutors,probation officers and parents will inspire kids to read this book. The sensational and controversial title of the bookwill automatically attract teens. And the fact that a man in the prison who has conned, cheated and connived in the past, writes this book while he's still inprison gives it both street and youth credibility. Some prisoners (in gangs) organize, plot andorchestrate Gang "Hits" from their prison cells. Shermanmethodically, skillfully and strategically plots a strategy to transform gangbangers from his concrete cage. Sherman writes: "We must bring every asset tobear and mobilize a task force of psychologists, prisoners, professors andpastors. Supplemented by raving mothers.... we must all, with any dungy,playmakers, homeboy, Industries and Curtis Lee etc. and want this Book (K. K.K.) in every hood, barrio and suburb, to prevent kids from coming here." I am an attorney with over 40 years of experience,Including 15 years as a prosecutor, and including many high profile and controversialcases. I can affirm that Sherman has never asked me to try to use this book asa bargaining chip for parole, a pardon or for political favor. He has onlyasked me to "please help me to get this book to these kids." Sherman wants to get "K. K. K." to youngsters likeGreg Pryzbiak, Colton Harris-Moore, and Cassius Marti etc. He Believes that whenJalen Rose, Bishop T. D. Jakes, Coaches and teachers read this book they seethat it gets to at risk kids and young adults. This book is unusual, unique, powerful, compelling andcandid. I strongly recommend it to teens, young adults, and professionals everywhere. 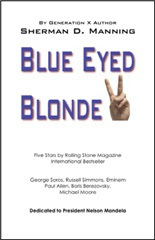 Brand NEW book "Blue-Eyed Blonde II" is out. All politicians should read this book! Book Two shines a powerful light on political corruption, torture and the Abu Ghraibs right here in America! Dirty police and prison cops beware! This book is a tribute to great lawyers like the late Johnnie L. Cochran, Willie Gary, Barry Scheck and Gerry Spence. I say write on Sherman! Attorney Murray Janus I'm definitely impressed with the power and spirit of this book. This thing reads like a John Grisham novel only its actually factual I absolutely expect this book to help carve out a transformation for the nation, on how we mete out justice. I was moved to tears by much of what I read within this book. I read the final chapter twice. I am glad Sherman wrote more, and more and more, in the final chapter I suggest we all inundate public libraries, schools, churches and juveniles with copies of this book.I cant think of a better or more impactful book than Blue-eyed Blonde. This is a gripping, scary and rock solid work of art. I suggest (also) that we buy copies and send them to pastors, youth leaders and elected officials. Max Lemon Associate Warden Old Folsom Prison. Hugging on my mamma from my jail cell! Please order the book today and help Sherman Manning beat his illness. I’m Peter Andrist and I’m very concerned about Sherman D. Manning, our founder and author of "Blue Eyed Blonde". He is at P.V.S.P. in Coalinga. But he has been in an outside hospital with valley fever for over eleven months now! We hope he lives! If he does he desperately needs your help. Please support us and write to Governor Arnold Schwarzenegger and Senator Gloria Romero. You can help! Please support NAPS. Buy "Blue Eyed Blonde" and pass it on! PLEASE PRAY FOR SHERMAN MANNING! We have a new LOGO. Please visit also our shop at cafepress.com to support our National Association for Public Saftey. brand new "Blue-Eyed Blonde II"
Sherman D. Manning calls for Action!